In patients with a clinical suspicion of myocardial ischemia and ST segment elevation, reperfusion therapy needs to be initiated as soon as possible 1. The electrocardiogram (EKG) is the primary test directing reperfusion therapy for acute myocardial infarction (STEMI), via the presence or absence of ST segment elevation 2. However, in patients who present acute myocardial infarction with concomitant Left Bundle Branch Block (LBBB), the electrocardiographic manifestations of acute myocardial injury may be masked, resulting in poor allocation of reperfusion therapy and suboptimal patient outcomes 2 3. 1. ST-elevation of ≥1 mm and concordant with the QRS complex (5 points). 2. ST-segment depression ≥1 mm in lead V1, V2, or V3 (3 points). 3. ST elevation ≥5 mm and discordant with the QRS complex (2 points). A total score of ≥ 3 is reported to have a specificity of 90% for diagnosing myocardial infarction. During right ventricular pacing the EKG also shows left bundle branch block pattern and the above rules also apply for the diagnosis of myocardial ischemia during pacing, however they are less specific. In uncomplicated Left Bundle Branch Block (without STEMI), the ST segment should be in the opposite direction the majority of the QRS. Any degree of ST segment elevation in a lead with a positive QRS complex was a highly specific sign of acute myocardial infarction 3. In Left Bundle Branch Block, leads V1-V3 always have predominantly negative QRS complexes, and therefore ST segment depression in lead V1, V2, or V3 should not be present, ST segment depression ≥ 1 mm in just one of these leads is diagnostic of STEMI. ST segment elevation of at least 5 mm in leads with a predominantly negative QRS complex indicates a moderate-to-high probability of myocardial infarction. In an attempt to improve accuracy, Smith et al. 4 derived the “modified Sgarbossa criteria,” in which the third criterion for excessively discordant ST elevation is replaced with a proportion (ST elevation / S wave amplitude ≤−0.25) 5. Image from Cai Q, Mehta N, et al 6. The ST elevation/S wave amplitude ≤−0.25 (ST elevation ≥ 25% of the depth of the preceding S wave). In leads with a predominantly positive QRS complex, this criterion also applies to ST depression / R wave amplitude ratio. 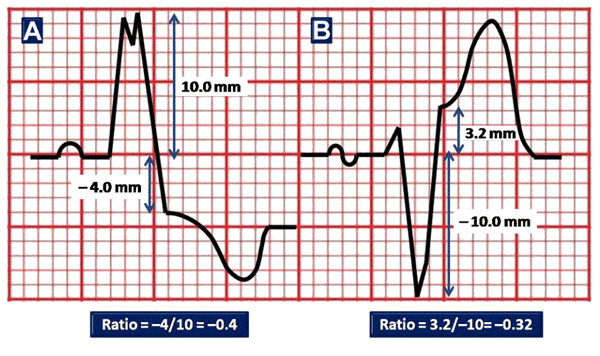 ST/S ratio is defined as the ratio of ST segment elevation measured at the J point to S wave depth 5. Criteria 1 and 2 are preserved in their current state. If either of these is present, the patient should be considered to have a STEMI 4. The authors reported improved diagnostic sensitivity from 52 to 91% in identifying angiographically proven STEMI but with reduced specificity (90 vs. 98%) 5. Before 2013 ACCF/AHA ST Elevation Myocardial Infarction Guideline, new or presumably new Left Bundle Branch Block has been considered a STEMI equivalent 7. The 2013 STEMI guideline makes a drastic change by removing previous recommendations, therefore, patients with suspected ischemia and new or presumably new Left Bundle Branch Block would no longer be treated as STEMI equivalent 6. For this reason Cai et al. have proposed a new diagnosis and triage algorithm 6. Cai et al. diagnosis and triage algorithm 6. If patients present with hemodynamic instability or acute heart failure, ischemia should be strongly suspected, and primary percutaneous coronary intervention should be considered. The Sgarbossa criteria are particularly helpful in this setting, due to their high specificity and positive predictive value. Clinicians can confidently treat for STEMI when a Sgarbossa score of 3 is reached (when the first or second criteria are present). In those with a Sgarbossa score of ≤2, an ST/S ratio −0.25 or less might further identify those likely to benefit from emergent reperfusion therapy. If none of these criteria are met, a diagnosis of AMI cannot be established, and such patients should be further evaluated with serial EKGs, serial specific biomarker assays, and bedside echocardiography 6. What are the 2017 ESC STEMI guideline recommendations for LBBB and STEMI? In the presence of LBBB, the EKG diagnosis of STEMI is difficult but often possible if marked ST segment abnormalities are present. The presence of concordant ST segment elevation appears to be one of the best indicators of ongoing MI with an occluded infarct artery. Patients with a clinical suspicion of ongoing myocardial ischemia and LBBB should be managed in a way similar to STEMI patients, regardless of whether the LBBB is previously known. It is important to remark that the presence of a (presumed) new LBBB does not predict an MI per se 1. 2. Meyers H. Pendell AT et al. 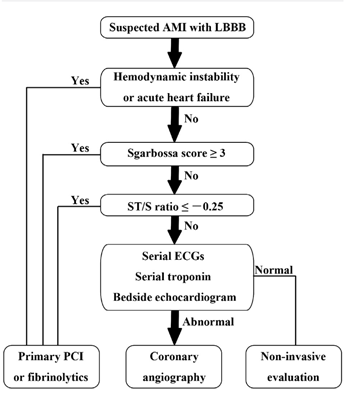 Validation of the modified Sgarbossa criteria for acute coronary occlusion in the setting of left bundle branch block: A retrospective case-control study. Am Heart J, Volume 170 , Issue 6 , 1255 – 1264. 4. Smith SW, Dodd KW et al. Diagnosis of ST-elevation myocardial infarction in the presence of left bundle branch block with the ST-elevation to S-wave ratio in a modified Sgarbossa rule. Ann Emerg Med. 2012; 60: 766–776. 5. Wilner B, de Lemos JA, et al. LBBB in Patients With Suspected MI: An Evolving Paradigm[Internet]. American College of Cardiology. Feb 2017 [cited: October 22 2017]. 6. Cai Q, Mehta N, Sgarbossa EB et al. The left bundle-branch block puzzle in the 2013 ST-elevation myocardial infarction guideline: From falsely declaring emergency to denying reperfusion in a high-risk population. Are the Sgarbossa Criteria ready for prime time? Am Heart J. 2013 Sep;166(3):409-13. doi: 10.1016/j.ahj.2013.03.032. 7, O’Gara PT, Kushner FG, Ascheim DD ET AL. 2013 ACCF/AHA Guideline for the Management of ST-Elevation Myocardial Infarction. Circulation. 2013;127:e362-e425. If you Like it... Share it..